In mid-July, Marines advised Afghan troops and police as they launched a successful operation to clear the Taliban from part of Nawa district, south of Lashkar Gah. The operation marked the first time in years that Afghan army and police worked together successfully, Reid told Marine Corps Times. “They weren’t doing it like U.S. forces would; they were doing it ‘Afghan good enough,’” said Marine Col. Matthew Reid, deputy commander of Task Force Southwest. In a wide-ranging interview, Reid discusses how the task force of roughly 300 Marines in Helmand province is helping Afghan security forces plan missions against the Taliban. Excerpts of the interview, edited for clarity and space. Q: What is the overall security situation in Helmand province? The surrounding districts immediately around Lashkar Gah are relatively secure. All those district centers are in the hands of the Afghan national security forces. It’s not a great picture overall, but we’ve been making significant progress here in the last couple months. It’s a combination of new leadership in the Army and police and, I think, just how we’ve been able to generate combat power through some of the focus of the ANDSF [Afghan National Defense and Security Forces] ― and then really take the initiative away from the Taliban. 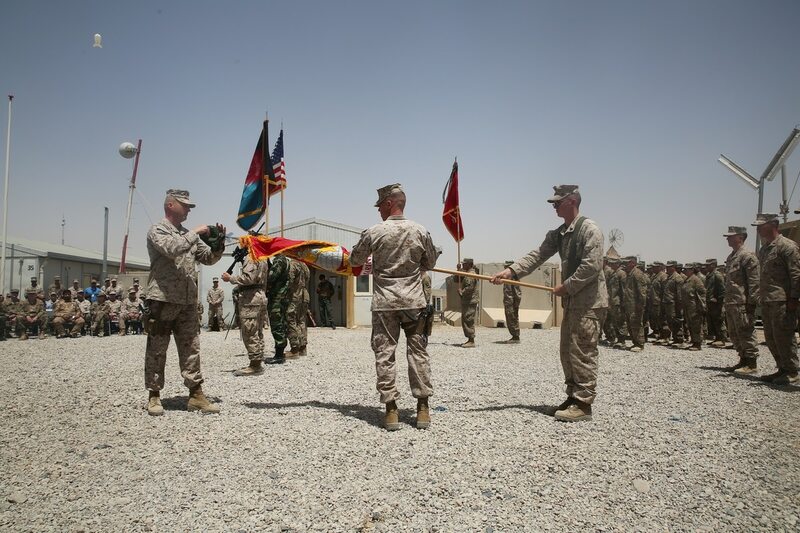 U.S. Marines with Task Force Southwest aided and advised Afghan forces in the recapture of the strategic district of Nawa. Q: Are just the district centers secure? So, they’re secure, yes, and elements of the larger part of the districts are secure, but not whole districts. It’s not like they’re locked up and held up in those district centers. They do have security in greater depth around them. But there are segments and pieces and parts of every district that are still in contention. Districts are large areas ― think any county or state. Q: Did Afghan security forces retake the whole district of Nawa or just the district center? There are still ongoing efforts to try to secure the entire district. It’s an ongoing struggle, but once you take a district center, good things follow from there. One of the unique things in Nawa is that the population base has largely been aligned to GIROA [Government of the Islamic Republic of Afghanistan] in the past. It was the first district we took back as Marines when 1/5 in there ― I think it was 2008 or 2009. The population really has an affinity to align with GIROA. It’s not completely secure, no, but that’s an ongoing effort. That’s part of the reason we’re here. Q: Are any Marines embedded with Afghan forces to call in air and artillery strikes? Our focus is at the Corps and Zone level to do a couple of things: force generation ― first and foremost ― to bring the fight to the Taliban and seize the initiative back from them. I think behind that building those institutional fixes, but only in as much as they feed into generating that combat power to take the fight to the enemy. It’s hard to develop institutional fixes when you’re in the middle of a gun fight. So first and foremost: generate the combat power to take the fight to the enemy; seize the initiative; develop that security belt around Lashkar Gah; and then as that settles over time ― it probably won’t happen in our rotation. The next rotation of forces to come out here can start to work on those larger institutional fixes that really get the Afghan security forces where they need to be. Roughly 300 Marines are in Helmand province. Q: What is the next step for Task Force Southwest? The district centers are only small islands within those districts. We’ve got to grow and expand that security. We’ve got to reach out to the local population. We’ve got to get the native Pashtun Helmand population to rise up and really align themselves with GIROA [the Afghan government]. Get the Afghan National Police forces strengthened to get them to really start to generate the combat power. The dichotomy here is the [Afghan National Army] are largely Tajik, Hazara; the MOI [Interior Ministry] forces are largely Pashtun. When we did the Nawa operation, the [Afghan Border Police], which are largely Pashtun Helmandis, they were the most aggressive force and they carried the day during the Nawa operations. I think as we go forward, it’s strengthening that security belt around Lashkar Gah, rebuilding those institutional fixes that I referenced earlier and then working on the governance piece as well as those local security forces. That’s really the next step and that’s a long-term fix. The Afghans have to get that right. We’re not going to fix that GIROA and [Afghan National Army], they’ve got to work hard as the MOI forces have got to work hard to gain the allegiance of the local population. Q: What has been the greatest accomplishment during the time Task Force Southwest has been in Afghanistan? I think the greatest accomplishment, really, is that integration of MOI and MOD [defense ministry] forces for the first time in a long time ― seeing that cooperation between them to go and take back a district center. I think that was a huge win. That was a huge morale boost, not only in Helmand province but across Afghanistan. It even got the president of Afghanistan, who came and visited and congratulated the team here ― not just the ANA, it was the provincial governor, the MOI commander, the ANA commander. He congratulated all of them on that effort. I think has been a significant action in our time here so far. Q: Are Afghan security forces capturing any new, unusual or high tech weapons from the Taliban? In all truthfulness, no. It’s the traditional Soviet-style weapons that they use. As they put the Afghan forces on their heels here, they’ve captured some Humvees and Ranger pickup trucks, but no new tech. We’re not seeing anything really migrate into theater yet. I was here in 2010 and 2011 and it’s really kind of the same stuff. Q: Do you have any final thoughts? You can talk about how long we’ve been here, but I don’t think it’s relevant. I think what’s relevant is why we’re here now. We’re here now to prevent that radical ideology from taking root back in Afghanistan. We cannot allow the Taliban to win. The last time they were in control is when they planned and plotted operations against the United States with al-Qaida and bin Laden. It’s almost irrelevant what happened in the past. It looked like the Taliban were tipping the scales here in Helmand, so we had to come back. We cannot let them take control again. There already are over 20 terrorist organizations in Afghanistan. Losing here means that there is safe-haven for those radical groups to come back and plan against the United States and our allies. I think we absolutely have got to stay here until its done. I don’t know how long that’s going to be but I know that the risk of losing here is too high, is too great.